Snow Removal Services Fort Collins: Let Us Handle Your Snow Removal Needs This Winter! Let Us Handle Your Snow Removal Needs This Winter! The first day of winter isn’t until December 21, but the weather we’ve had in recent days could easily convince you otherwise. It’s time to begin thinking about snow removal, and if you’re tired of bundling up in the early hours of the morning to shovel your driveway or sidewalk, then get in touch with a member of Advanced Landscaping & Sprinklers, Inc. to request more information about our snow removal services. When you’ve finished reading today’s entry, contact our Fort Collins snow removal experts by calling 970-305-3206 , or by filling out our convenient online contact form. Whether you have a small residential driveway or a large corporate space that needs to be cleared before employees arrive, our team can handle the job! Slips and falls are far too common during the winter. Many people forget that icy layers can build up underneath a fresh blanket of snow and create hazardous conditions, and subsequently end up in the hospital. Even if you have the luxury of parking your car in the garage, you need to ensure that your property is safe for both passersby and anyone who comes to the door. With caroling season just around the corner, you can’t risk someone slipping and hurting themselves as they come up the driveway. As a business owner, a serious injury on your property is one of the last things you want to deal with during the peak of the holiday season. You could be liable for both customer and employee injuries, and negotiating a legal battle would be an unfortunate way to kick off the new year. Many of your employees will be arriving early in the morning, and you want to make sure that everyone can make it inside of the building safely. 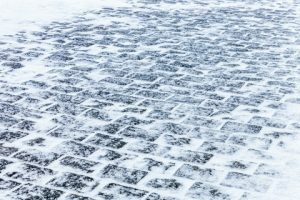 If you own a restaurant or retail store, then it’s arguably even more important to ensure that the sidewalks around your space have been properly cleared, de-iced, and salted after a snowstorm. At Advanced Landscaping & Sprinklers, Inc., we know that you have a busy schedule. Whether you leave for work early in the morning, or rush the kids out the door Monday through Friday, we know that snow removal can be a time-consuming hassle. Instead of waking up even earlier to shovel your driveway, let our snow removal professionals come and take care of the hard work for you. You’ll have enough time to go about the rest of your day as you normally do, and best of all, you won’t have to brave the subzero temperatures! We hope that today’s post has helped you to better understand why you should invest in professional snow removal. Our team uses state-of-the-art equipment to quickly clear spaces of any size, and we also use eco-friendly de-icing agents that will prevent layers of ice from building up after we’ve left. Get in touch with us today to schedule snow removal for your home or business!